For efficient, reliable group transportation in Palo Alto and the rest of California, rely on Champion Charter Bus. We’re experts in organizing the perfect charter bus rentals for groups of all sizes for events of all kinds. Our team is available 24/7 to help you plan your trip when you call us at 650-204-9487. 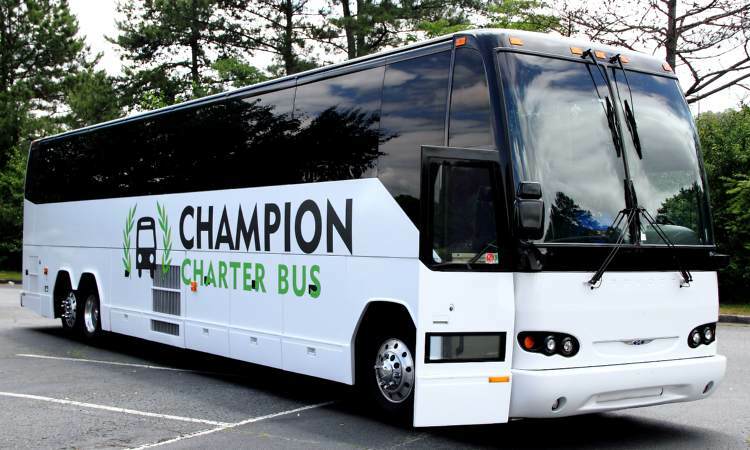 Champion Charter Bus makes group travel a breeze, wherever you go. We’ve helped hundreds of groups across California organize the best transportation for their corporate event, wedding, school trip, sports team, private trip, and more. We can provide your group with the perfect bus rental to fit your needs, with bus options ranging from 18-passenger minibuses all the way to 56-passenger motorcoaches. We service a variety of major cities in the West, including San Francisco, Los Angeles, Santa Monica, Phoenix, Denver, Las Vegas, and more. Because of our extensive network of bus rentals and 24/7 customer support, planning a trip has never been easier. Ready to learn more? Call us at 650-204-9481. Call 650-204-9487 to book your Palo Alto charter bus. While Palo Alto is a technological hub with headquarters of major companies in Silicon Valley, there’s still plenty to do for groups on private trips. Even better, with a personal bus rental to chauffeur you around, you won’t have to worry about finding new places, parking, or getting lost. Palo Alto is the perfect destination for outdoor lovers. Have your bus drop you off at Castle Rock State Park for camping, hiking, and horseback riding. Your bus will have plenty of space for all your gear and luggage. If the outdoors aren’t your scene, your driver can take you any other attraction in the city, like the Palo Art Center. With Champion Charter Bus, you’re in complete control of your trip. Safe transportation makes school events more fun, and when you work with Champion Charter Bus, you can rest assured your students will be in good hands. We only work with certified bus providers and professionally-trained, licensed drivers, which is why so many schools and colleges choose to rely on us for field trips, campus tours, away games, and other school events. Your field trip experience at the Palo Alto Junior Museum & Zoo is even better with a comfortable, reliable charter bus rental. Students can stay entertained with flat-screen TVs and DVD players, while chaperones and teachers can relax in reclining seats. Spend quality time with one another while you leave the transportation logistics to the professionals. It’s easy to transport sports team to away games when you don’t have to focus on the transportation. With spacious luggage bays and overhead bins, your team won’t need to leave behind any luggage or sporting gear. Champion Charter Bus can take care of all your transportation troubles so you can focus on victory. Don’t let late arrivals and disorganization ruin your event. With Champion Charter Bus, you can keep attendees on time and together in a private charter bus rental dedicated to your special event. From large-scale events like corporate conferences and weddings to private functions for military and government personnel, we’ve got you covered. For corporate events, impress clients and motivate employers with a professional bus rental, featuring an all-black interior for a stylish look, WiFi and power outlets for nonstop productivity, and reclining seats for optimal comfort. Your entire group can focus on having a successful event without finding transportation on their own. Make sure all guests arrive stress-free and on time for your wedding at a venue like the Palo Alto JCC. Champion Charter Bus will find you a stylish minibus rental to shuttle guests between venues and their hotel to ensure everyone can celebrate with you without the hassles of transport to hold them back. Traveling with a group can be a rewarding and memorable experience with the right resources. Champion Charter Bus works with your specific needs and trip to find the perfect bus rental for your trip, no matter what kind. Call our 24/7 team at 650-204-9481 for a free quote.